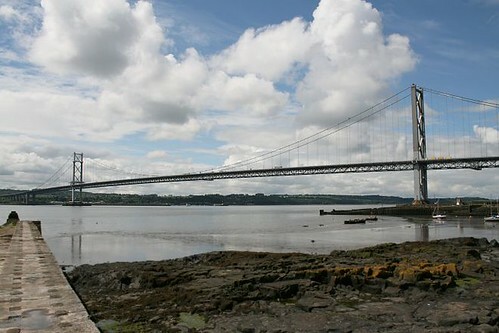 The announcement that a new bridge is to be built across the Forth Estuary barely received a mention in the London-based UK press. I only managed to find an article in the Guardian. There was also an article tucked away on BBC News. This is quite disgraceful, considering that it will be one of the biggest civil engineering projects in the country. The existing Forth Road Bridge, which opened in 1964, is still an engineering marvel, sweeping across the estuary in a single, graceful span. At the time it was built, it was the fourth longest in the world and the longest outside the USA, also making it the first bridge in Europe to have a span longer than a kilometre. Together with the nineteenth century rail bridge, it forms part of a world-famous view that no visitor to that part of Scotland should leave without seeing. Unfortunately, traffic on the road bridge has outgrown all estimates. Corrosion has also been found inside the main suspension cables, which has caused a few of the thousands of wires that make up the cables to break. Worst-scenario estimates are that the bridge may have to close to lorries in 2013, and close completely in 2020. Hence the apparent need for a new bridge. So far, amid all the reports (in Scottish newspapers) of the proposed new bridge, there has been little mention of the fate of the current bridge. Suggestions that it could be demolished are quite alarming. The 40-year-old bridge is already an important part of our heritage, and indeed this is recognised by the Category A listed status it was awarded in 2001. Fortunately, The Scotsman suggests that “experts believe it will ultimately be repaired to help cut cross-Forth congestion, which is predicted to continue to grow.” Let’s hope that will be the case, but at the the same time we should not be complacent. A campaign is needed to secure the bridge’s future. Environmentalists are furious that a new bridge is to be built, as it will lead to increased traffic. They say the existing bridge should have been repaired instead. But they then go on to criticise the Scottish Government for “failure to guarantee the existing road bridge would be demolished once its ‘replacement’ was built.” Demolishing the bridge hardly seems a “green” measure. It would take a huge amount of energy (not to mention money) to demolish the structure, yet most of it is still perfectly sound. Transferring traffic onto the new bridge will allow the old bridge to be closed, making comprehensive repairs cheaper, easier and less disruptive. When the repaired bridge reopens, it can be restricted to cars only, or if the environmentalists object to that, why not use the old bridge exclusively for trams or buses? The new bridge will have space reserved for future public transport use. Yet this provision has already been criticised as insufficient. One civil engineer has claimed that only 2500 passengers could be carried an hour, leaving 35,000 more people to use their cars. By utilising the existing bridge for public transport, the capacity could be increased many times over. The proposed new bridge has been labelled as “iconic”, yet the artist’s impression shows a fairly standard-looking cable-stayed bridge. Unfortunately, modern construction techniques, which have made it easier to site bridge piers in water, have caused bridges to become more ugly. One only has to look at the Severn Estuary, where the elegant Severn Bridge of the ’60s has been joined by a modern, functional bridge that is largely just a concrete motorway viaduct, snaking its way across the mud. The third Forth bridge is unlikely ever to match its predecessors in terms of achieving “iconic” status. Let’s ensure that this symbol of 21st century progress will always have those icons of the 19th and 20th centuries standing alongside it. The campaign to save the Forth Road Bridge should start now. And are you starting the campaign?